You must provide your full name, address and contact details to our Sales Agents, Wards, with details of the development where your family or friend wishes to purchase a Golding Places shared ownership property, on or before the expiry date of 31 August 2019. Only one “Recommend A Friend” incentive voucher can be used per home purchase. The payment of £250 becomes payable on legal completion of the purchase of the new Golding Places shared ownership property by your recommended friend of family member. Please allow 2 weeks after the legal completion date for payment. 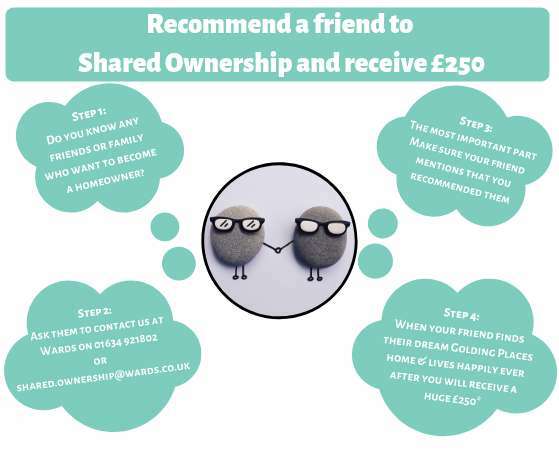 Golding Places reserves the right to withdraw the Golding Places “Recommend A Friend” incentive at any time. This reward expires on 31ST August 2019.